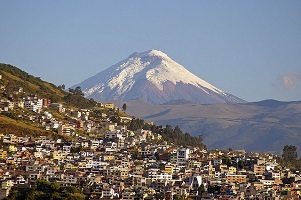 The capital cities of Bolivia, Ecuador and Peru are vulnerable to climate change, partly due to their dependence on water from retreating Andean glaciers for human consumption, industrial use, hydropower production, agriculture and other uses. This comparative Inside Story by Miguel Rodríguez Tejerina of Servicios Ambientales highlights the challenges, enabling factors, lessons learned and implications for climate compatible development illustrated by a project to assess the cities’ carbon and water footprints. Assessing carbon and water footprints in Andean cities: Comparative study of La Paz, Quito and Lima emphasises the common aspects and main differences in the experiences of these Andean cities. After the project assessed the footprints of the three cities and their municipal governments, the municipalities prepared action plans and pilot projects to tackle the most critical issues. The first phase of the Cities Footprint Project was co-sponsored by CDKN and the Development Bank of Latin America (CAF), facilitated by Fundación Futuro Latinoamericano and implemented by the Bolivian consultancy Servicios Ambientales. The project continues into a second phase. Calculating city-wide carbon and water footprints has proven useful for decision-making in urban planning and management, and has resulted in action plans, policies and projects in the three cities. Strong high-level political will, ‘champions’ in municipal governments, innovative financing and an enabling institutional environment at the municipal level are critical for successful urban climate compatible development. Buy-in from identified key stakeholders representing different city sectors (transport, residential, commercial, industrial and public) has been important to building momentum for climate compatible development. Measuring carbon and water footprints and subsequent planning efforts can stall if no further steps are taken to move to a project implementation phase. Local governments are already working to identify the best ways to create partnerships with key actors, gain access to financing and technology, and institutionalise footprint-related processes in their operations.